For more detailed instructions on installing Directory Server 9.0, see the Directory Server Installation Guide. Directory Server 9.0 requires either Sun JRE 1.6.0 or OpenJDK 1.6.0. OpenJDK is also available for download from http://openjdk.java.net/install/. Downloading packages from Red Hat Network requires specific entitlements for the account for the 9.0 release. 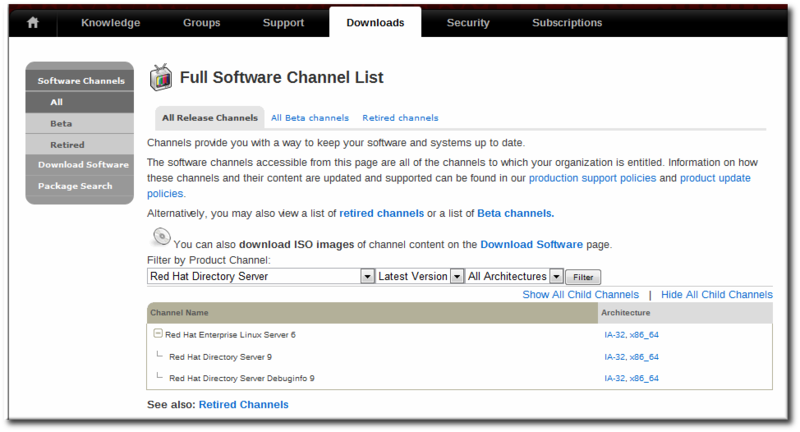 Click the Downloads tab, and select the Red Hat Enterprise Linux channels. Set the product to filter for Red Hat Directory Server. Open the Downloads tab, and begin downloading the ISO. Install the packages using rpm. The PassSync.msi installer is available in the WinSync package in the Directory Server channel, through the Downloads tab, same as the ISO image. Download this file to the Windows machine, and then double-click the icon and go through the installer. There are two PassSync packages available, one for 32-bit Windows servers and one for 64-bit. Make sure to select the appropriate packages for your Windows platform. See the Directory Server Installation Guide for more information about setup-ds-admin.pl script options and the Directory Server configuration interface. This upgrade procedure assumes that the original machine and the new machine have the same architecture (i.e., both are 32-bit machines or both are 64-bit machines). Upgrade is only supported from 8.2 to 9.0. 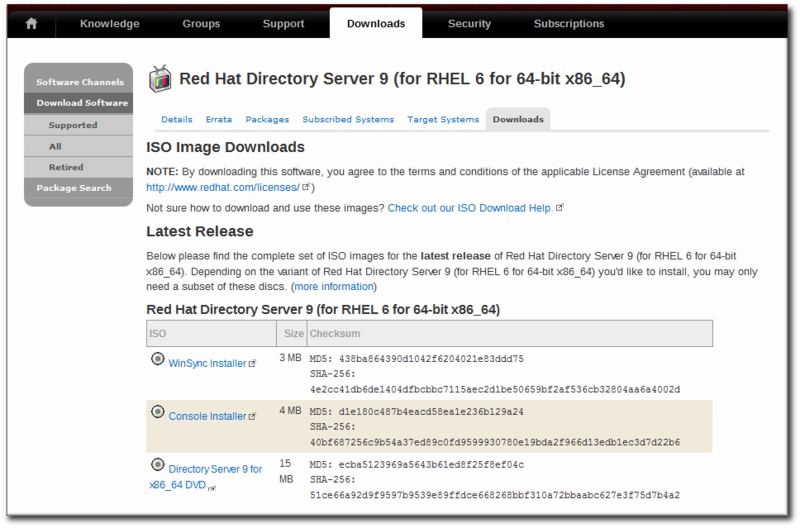 Other versions of Red Hat Directory Server should be migrated to 8.2 and then upgraded to 9.0. Migration cannot change the hostname used by the Directory Server and Admin Server. Stop the Directory Server and Admin Server. Tar (almost) all of the files and directories for the original Directory Server 8.2 instance. The admserv.conf and httpd.conf files should not be included since the new versions of these files should always be used. Additionally, these tar files don't contain the error and access log files. These files are not necessary for upgrading an instance but can be stored separately. Make sure that partition where the tar file is created has enough space to store all of the configuration and data. The cldb location assumes that the changelog is located in the default changelog directory. If the changelog is in a different location, use the appropriate directory. If replication is not enabled, this directory can be omitted. Copy over the tar file to the new machine. Make sure that the new Directory Server instance is not running. Run the setup-ds.pl command in offline mode to upgrade only the Directory Server configuration. This performs all of the basic setup required to perform any schema or data changes. Run the setup-ds-admin.pl -u script to update the configuration. Make sure that the Directory Server and Admin Server are running when the script is run. Update syntaxes and the enable syntax checking. In 8.2, syntax checking is available, but disabled by default, while a new 9.0 instance has syntax checking enabled by default. Syntax validation checks every modification to attributes to make sure that the new value has the required syntax for that attribute type, so this is a beneficial configuration attribute to use to ensure data quality. Run the syntax-validate.pl Perl script to validate and, if necessary, correct any syntax errors in the migrated 8.2 data. /usr/lib64/dirsrv/instance_name/syntax-validate.pl -D "cn=directory manager" -w secret -b "dc=example,dc=com"
Enable syntax checking for the migrated server. Verify that the directory databases have been successfully migrated. Directory Server 9.0 normalizes DN syntax during the upgrade import process. Make sure that the upgraded database is functional and contains all the data before deleting the backups. If the search results are correctly escaped, the original database backend instance directory can be removed.